Soil : Third terrace. (Kimméridgian). Care of the vineyard : Guyot pruning. 5 buds on the fruit-bearing and 2 on the spur. Desuckering by hand. Thinning. Green harvest. Hand- picked. Vinification : Maceration on skins for 48 hours. Long and low temperature fermentation in thermo regulate stainless vats (control of the temperature). Pumping over and delestage before D°1045. Long maceration with pomace, with micro oxygenation. Drawn off secondary malo-lactic fermentation. Maturing : In French oak barrels for 20 months minimum. Regular topping-up. Tasting : Blackish colour with garnet-red tints. 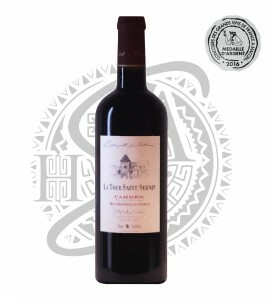 The nose gives off complexe aromas such as spices, dark and red berries, hazelnut, woody torrefaction aroma, chocolate. The attack in the mouth is supple, a mid-mouth well-rounded, very fleshy, well-balanced. A sweet and well-structured final with harmonious tannins. A wine to lay down but can be appreciated at present ! Wine/food : Tajine, leg of lamb, red meats, spicy cooking, game, strong cheese.